Tumelo Moketsi looks at a stone at Wits University on April 11, 2012, in Johannesburg, South Africa. 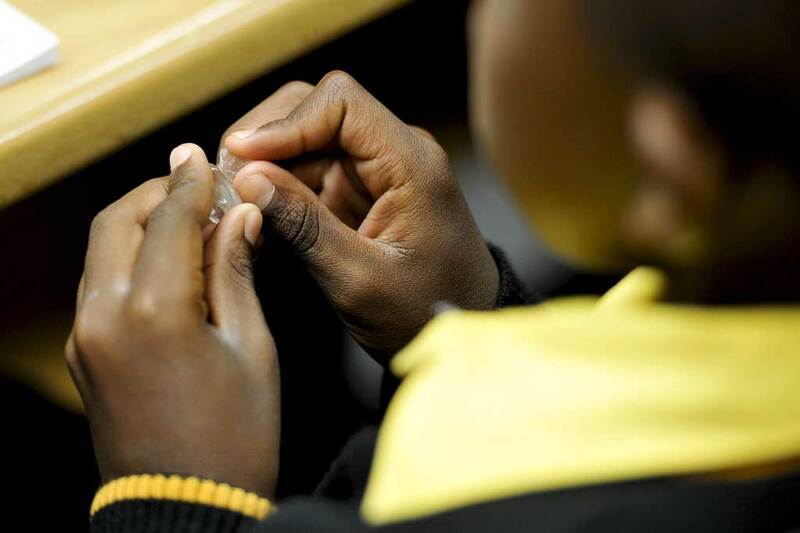 The University of Witwatersrand hosted a program to educate learners about Gemmology (the study of gemstones); called the 'Junior Gemologist program'. JOHANNESBURG - Two principals and a teacher in three Free State schools have been suspended amid allegations of racism, the provincial education department said on Monday. "They were suspended on Friday," said department spokesman Howard Ndaba. "Following the report by the SA Human Rights Commission, we are doing our own internal investigation, which starts today. Within 30 days we hope to finish." The three are Francois Schoon, principal of the Dr Viljoen Combined School in Bloemfontein, Charles Liversage, principal of Christian De Wet Hoerskool in Dewetsdorp, and Trudy Erasmus, a life orientation teacher at St Helena Primary school in Welkom. The SA Human Rights Commission had investigated two of the cases --Schoon and Liversage. The commission released a report on the Dr Viljoen Combined School last week, finding it guilty of hate speech towards black and coloured pupils. It found that pupils at the school were exposed to dehumanising and racist treatment from staff, including the principal, in May 2013. Pupils alleged staff called them racist, derogatory, and belittling names, such as "k*****s, baboons, monkeys, and little black b*****s". They further alleged that one of the teachers told them that "after seeing their ugly faces, he adores his dog even more because it is more beautiful than them". Pupils claimed teachers told them to go back to black schools in townships as they would never succeed in life and would end up like their parents who worked in chain stores. The principal of Christian De Wet Hoerskool had been accused of ill-treating black pupils and the alleged assault of a Grade One boy. According to reports, the life orientation teacher at St Helena Primary allegedly put up a racist display. In a Grade Seven classroom, the old South African flag was reportedly on display, along with a picture of Economic Freedom Fighters leader Julius Malema next to a monkey. The SAHRC said it was not investigating this case. "We have not received a complaint relating to the St Helena matter. We are not aware of what actually transpired there," spokesman Isaac Mangena said.